How you can tell this is not a first edition. 'Of course, it is known that the EARLIEST versions of the prints of both Kasamatsu and Asano bear a 'key-block' printed date in Japanese writing within their lower left margins, whereas later editions do not. At this point Mr. Yamada revealed an amazing discovery--he explained that immediately upon completition [sic] of each prints' very first edition (which comprised usually 100 sheets) the 'key-block's' carved date then got cut from the block. Hence, ALL later reprints--although to a great extend still printed during the lifetime of the artists--are therefore undated. The significance of this revelation is that such dated 'first edition' prints are much more scarce than previously believed. Additionally, it is also observed that occasionally 'first editions' and 'later editions' show even further differences than simply the 'date-block' of the first version. For example, here we see in the leftside [sic] image a first version of Kasamatsu's 'Spring at the Moat,' while to the rightside [sic] is a later edition. 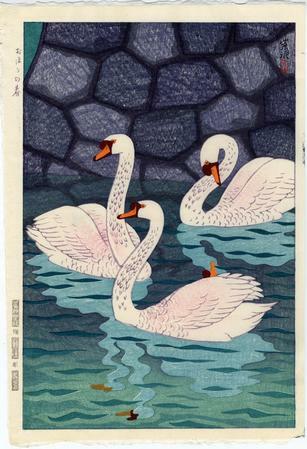 Apart from the different color scheme of the background wall and the wave pattern - the early version tends to be warmer - and a different 'bokashi', we notice, that the printer added in the later (right) version a red forehead into the reflection of the middle swan, which does not exist in the early version. Also, the 'seals' are different. Compare the large artist's 'seal' in the lower right image corner of the first edition with the 'standard' Kasamatsu 'seal/signature' combination in the right upper image corner of the late edition." The use of the bold print in the paragraph shown above is our decision and not in the original text. We found another copy of this print in the Oni Zazen Collection.